Here is a sci-fi movie that fires on all cylinders - or rockets - or computer chips: The writing. The acting. The soundtrack. The CG. It's all provocatively off-the-wall and on-the-mark, with something for every adventuresome movie fanatic. 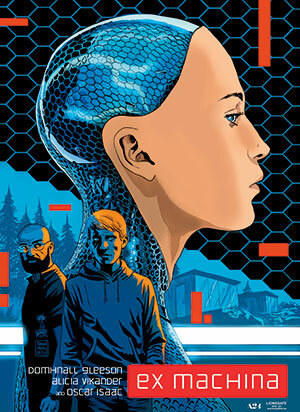 Basically, Ex Machina is a ménage of trois characters in an encapsulated futuristic glass residence playing mind games in the labyrinth of its hide-and-see architecture: a brilliant scientist, Nathan, and geeky programmer, Caleb, and an out-of-this-world A.I., Ava. Nathan, the billionaire CEO of BlueBook, the world's largest Internet search engine, lives wrapped in terrain that surely God configured on the third day of His earthly creation. But Nathan's hobby aims to replace God on the seventh day. He procreates robots that (or who) think - at least he hopes so. Nathan has readied Ava to confront humankind. Enter Caleb, one of his company's programming minions. The cerebral, mythical, fanciful and metaphorical references range and vary: Nathan (is he Frankenstein or God?) creates Ava (is she Eve or angel?) and he needs the quasi-smarty pants Caleb (Adam or Jesus?) to field test his creation. Caleb is a save-the-damsel-in-distress but not-quite-so-handsome-or-charming prince engaged by Nathan to challenge and interact with Ava, his master work, his mistresspiece. Can his hand-maiden be the model for man-made conscious beings? Is she the real deal? Can Caleb corroborate the truth? The proof? No, this is not a movie debating Creationist theories - or maybe it is. This is a film that you can love, debate and explore on so many tiers. 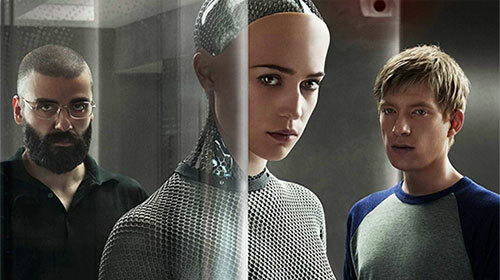 Ex Machina is grim and Grimm, also witty and whimsical. For the aftermath confab, keep the internet handy to explore all its intellectual references. It is not necessary or fundamental to enjoying the movie, just a bit of added cerebral fun for those who love a hefty discourse after a heady flick. 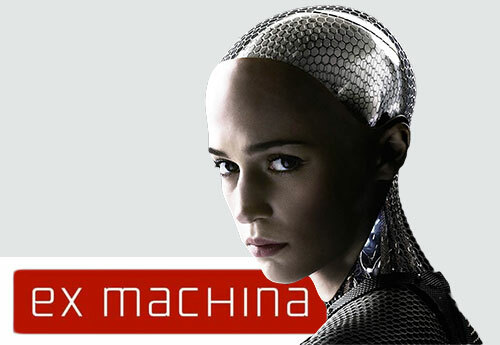 Still, start with the title: Ex Machina. Why not deus ex machina (masculine), or, better yet, dea ex machina (feminine)? The amalgamating artists inject all you need to reach near-movie-nirvana in the theater. Director Alex Garland is the lyricist-composer-conductor of the film, (mere writer/director lacks the stature for this collaborative creation). The actors provide intelligent performances via versatility, physicality, intensity, curiosity and comedy: Oscar Isaac, Alicia Vikander, Domhnall Gleeson and Sonoya Mizuno. Cinematographer Rob Hardy captures the essence of Mother Nature and human nature. Composers Geoff Barrow and Ben Salisbury know how to tamper and taper our emotions to the action and interactions. 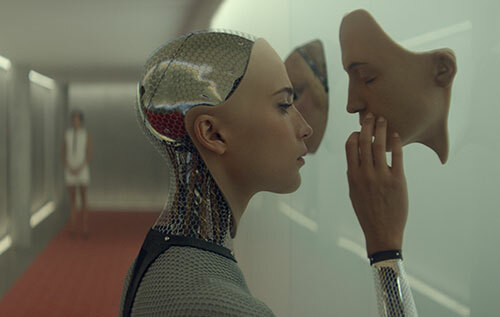 And VFX Supervisor Andrew Whitehurst and his team have assembled an android we adore unequivocally. 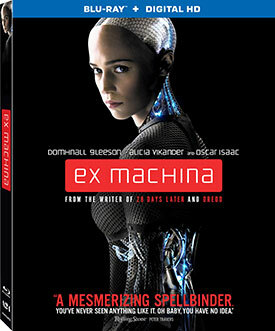 If there were ever a reason to buy - not rent - a Blu-ray DVD, Ex Machina is the poster child. I am an incurable Extras addict, and you will see why when you indulge in the fine smorgasbord of delectables offered here. Moreover, the Extras are so amazing that to review them would be to spoil them. Yes, there even can be spoilers for the Special Features! Promise yourself to leave enough time, especially to view the SXSW panel presentation. True, I was swept up in the enthusiastic crowds at this year's South by Southwest at Ex Machina's screening, and true, I met the wonderful Isaac at the 2013 Austin Film Festival, where I complained to him in person about the squandered use of his talent in The Bourne Legacy. Naturally he was very very gracious. I am a fan, then and now.